To Our Shareholders and Investors | GENDAI AGENCY Inc. I would like to sincerely thank all of our shareholders for their support and patronage. I am pleased to report the financial results for the fiscal year ended March 31, 2018. During the fiscal year ended March 31, 2018, the Japanese economy saw a turnaround in exports and capital investment as well as record corporate earnings while overseas economy gradually recovered. Overall, it has been registering a gradual recovery in general as consumer spending showed signs of gentle improvement supported by recovering employment and income environment. The pachinko parlor industry, which is the Group’s main customer, continues to face a difficult business environment in terms of revenue, as the frequency at which users play games and the amount of money they spend on gaming declined. The number of parlor operators who are concerned about their future has been increasing given the recent measures to prevent dependence and tightening of industry restrictions for curbing the gambling properties. Interest of the industry as a whole for making investments such as opening of new parlors, refurbishment of existing parlors and purchase of new gaming machines is also showing significant decline compared with the past. In such a difficult business environment, the Group aimed to raise the level of revenue by actively pursuing sales expansion of Internet media and focusing on the printing business, which serves industries other than the pachinko parlor industry, in an effort to transform its earnings structure in the mainstay advertising business. Furthermore, the Group at the same time worked to control fixed costs to improve its profitability. As a result, net sales for the fiscal year ended March 31, 2018 came to 13,244 million yen (down 16.4% year on year), operating income totaled 743 million yen (down 41.4% year on year), ordinary income came to 716 million yen (down 43.5% year on year) and net income attributable to parent company shareholders was 504 million yen (down 39.4% year on year). Taking into consideration these business results, the Group will pay an annual dividend of 25 yen per share, including a year-end dividend of 13 yen per share. We appreciate your continued support and patronage. In the fiscal year under review, demand for advertisement in the pachinko parlor industry deteriorated significantly, as pachinko parlor operators continued to trim advertising expenses due to worsening profitability and demand for advertising new machines fell due to a decline in frequency of new machine replacements. Further, an extreme decline in new parlor opening reflecting the loss of motivation to open new parlors had a significant impact on demand for large-scale parlor opening advertisements. By item, demand for print media advertisements led by flyers, which have been the mainstay of the pachinko parlor advertisement, has been rapidly shrinking. Under such circumstances, the Group promoted sales expansion of Internet media led by its own “Pachi 7” media and DSP advertisement “Pachi Ad” and enhanced sales efforts in the printing business targeting other industries in an effort to transform its earnings structure by shifting in stages to Internet advertisements from print media advertisements. From the aspect of cost, the Group focused on controlling fixed costs by streamlining and labor saving through drastic review of the ordering process. While these initiatives have been effective to a certain extent, they were not enough to offset the rapid decline in demand. As a result, net sales of the segment came to 13,112 million yen (down 16.2% year on year) and segment income totaled 1,204 million yen (down 23.8% year on year). During the fiscal year under review, consolidated subsidiary Land Support Inc. newly signed a lease property intermediary project (12 million yen) in addition to the land leasing project it newly acquired in February 2017 in Kashiwa City, Chiba Prefecture. Net sales of the Real Estate Business totaled 63 million yen (down 47.8% year on year) and segment income came to 27 million yen (down 53.8% year on year) due to the impact of the sale of the land lease property in Kobe City, Hyogo Prefecture in the previous fiscal year. During the fiscal year under review, the Group continued to test the storage business. GDLH Pte. Ltd., a Singaporean consolidated subsidiary of Gendai Agency, established at the end of the previous fiscal year to enter the casino operation business in Southeastern Asia, officially began operation of a Cambodian branch in June 2017 and has been acquiring contracts for operating slot machines at casinos in Pailin District in the country. The Group sold the entire stake in GendaiR1 Ltd., which was testing a restaurant business in Hong Kong, outside the group in the fiscal year under review and removed it from the scope of consolidation. As a result, net sales of the segment came to 69 million yen (down 21.0% year on year) and segment loss totaled 134 million yen (compared with a loss of 19 million yen a year earlier) due to the impact of making initial investment in the casino operation business. 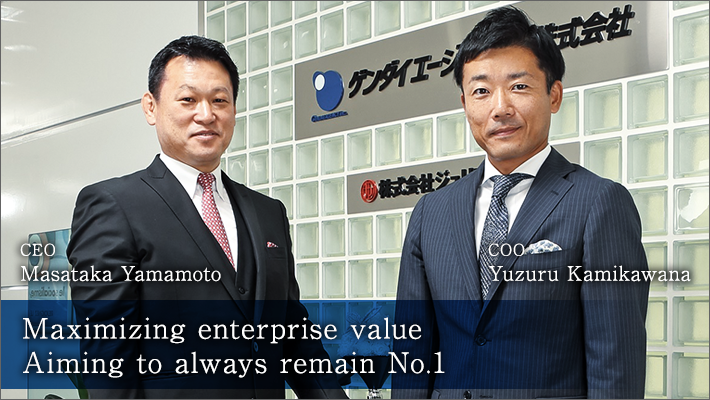 As the leader in the pachinko parlor advertising market, the Group will strive to add more value to its services and improve productivity, which are its strengths, so as to ensure stable profitability even in an adverse environment. At the same time, the Group will consistently seek new business opportunities and actively develop its business to ensure sustained growth for the Group. The main strategic issues to be addressed in order to achieve sustained growth are as follows. As we work to maximize our corporate value, we will disclose information to all of our shareholders and investors in a proactive and timely manner and follow a policy of providing returns to shareholders that reflect our business performance. We look forward to your continued understanding and support.